Born in New Zealand in 1939 and living in the US since 1973, Annea Lockwood is known for her explorations of the rich world of natural acoustic sounds and environments, in works ranging from sound art and installations, through text-sound and performance art to concert music. Her music has been performed in many venues and festivals including: the Possibility of Action exhibition at MACBA Barcelona, De Ijsbreker, the Other Minds Festival-San Francisco, the Walker Art Center, the American Century: 1950 – 2000 exhibition at the Whitney Museum, the Los Angeles County Museum, Queen Elizabeth Hall, the Westdeutscher Rundfunk, CNMAT Berkeley, the Asia-Pacific Festival, Donaufest 2006 Ulm, the Donau Festival Krems, the 7th Totally Huge New Music Festival Perth, Ear To The Earth Festival – New York and Sonic Acts XIII. Her sound installation, A Sound Map of the Danube, has been presented in Germany, Austria and the USA. This is a surround ‘sound map’ of the entire Danube River, incorporating a wide variety of water, animal and underwater insect sounds, rocks from the riverbed and the voices of those whose lives are intimately connected to the river. Other recent projects include Ceci n’est pas un piano, for piano, video and electronics commissioned by Jennifer Hymer; Jitterbug, commissioned by the Merce Cunningham Dance Company, a six channel soundscape with two improvising musicians; and In Our Name, a collaboration with Thomas Buckner based on poems by prisoners in Guantánamo. 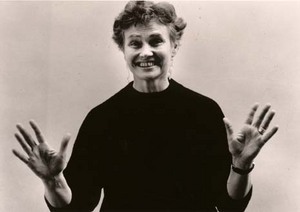 She was a recipient of the 2007 Henry Cowell Award. Her music has been issued on CD and online on the Lovely Music, Ambitus, EM, XI, Rattle, Lorelt, and Pogus labels.